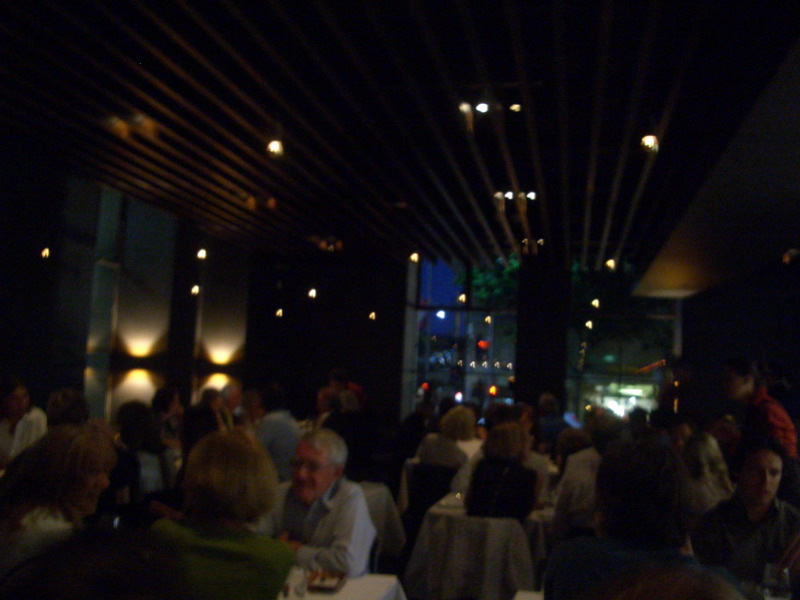 On a Tuesday night a little while back (yes, a while back... my dining companions and Jon have been badgering me for some time to put this review up - sorry for the delay! 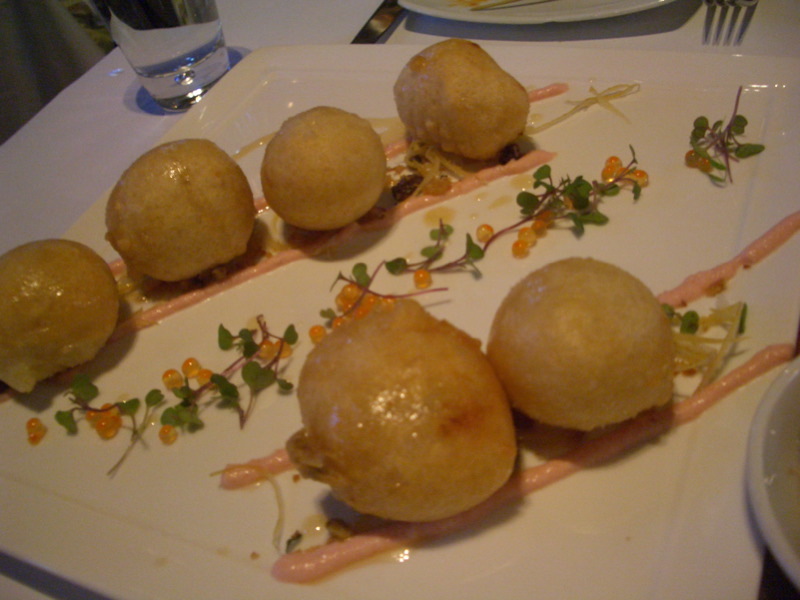 ), I went to dinner at The Press Club with the girls (K1, K2, A, M and B). Now, I'm going to be completely honest with you and say that whilst I have been lucky enough to have some delicious home-cooked Greek food in my time, I had always found the food served in Greek restaurants here in Melbourne to be either uninspiring or - in the case of a meal years ago at a certain Greek restaurant in Abbotsford - overpriced and downright terrible. So much so that Greek had become my least favourite cuisine to eat out. But on this November Tuesday night, my childish prejudice against Greek restaurant food was overturned and my faith restored. We had a wonderful meal!! 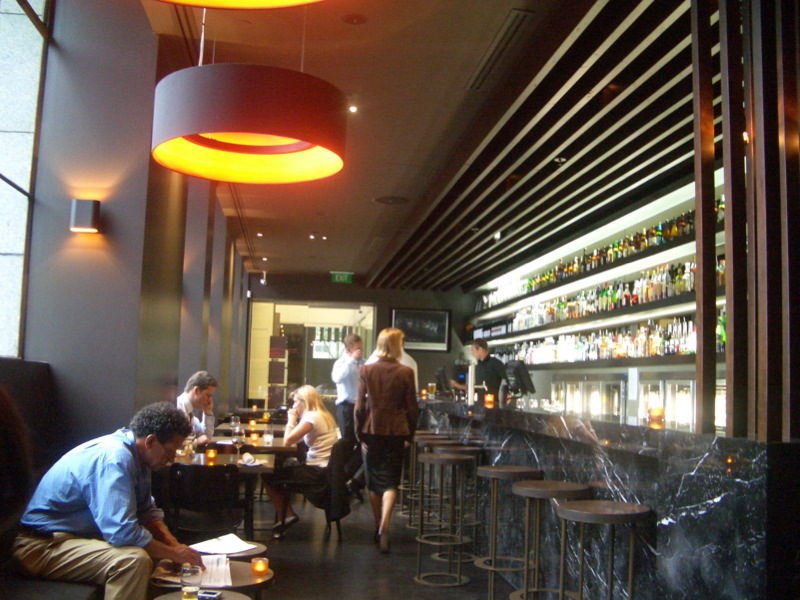 Before moving in to the restaurant, we started with a drink in the adjacent Press Club bar (see above photo) which, I have it on good authority, does equally delicious food at slightly cheaper prices. 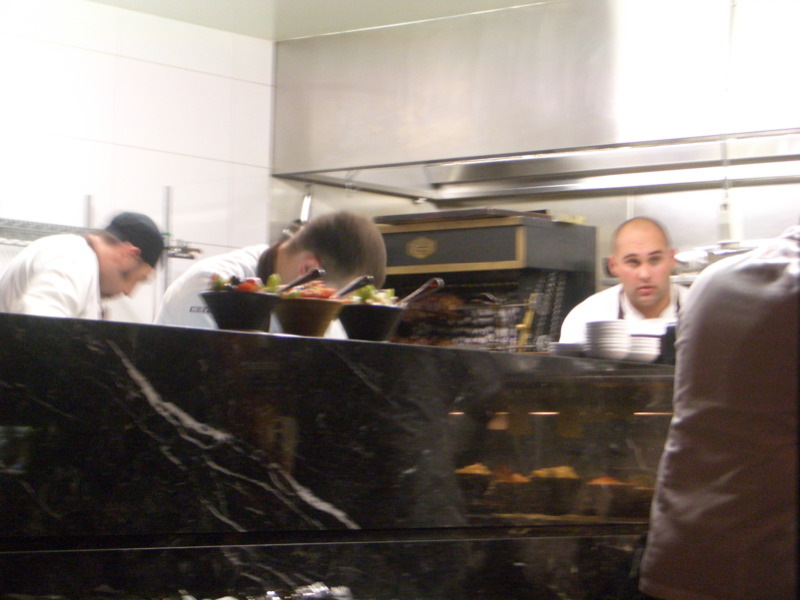 George Calombaris' well-disciplined kitchen, visible to the diners, hard at work. The Press Club gets its name because it occupies the old Herald-Sun building on the corner of Flinders and Exhibition Streets. The fit-out is really lovely. 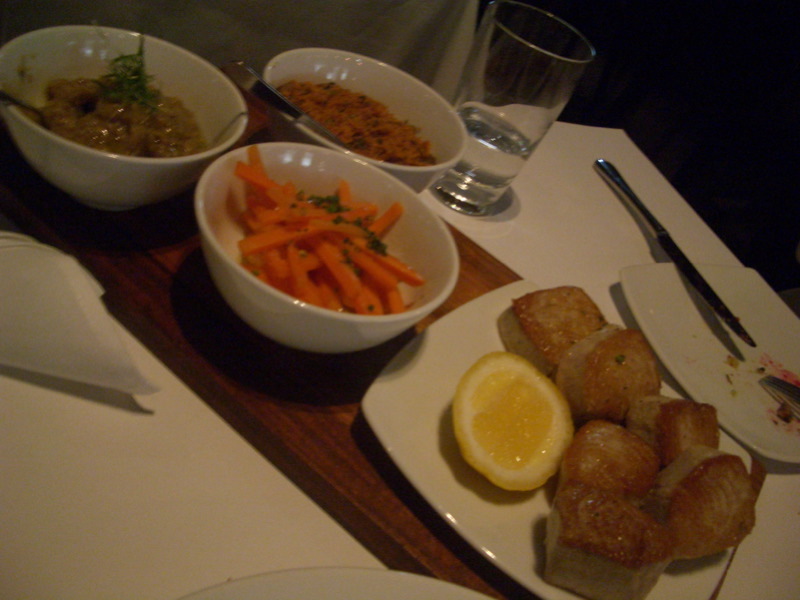 The first course to arrive was the Mezedes (tasting) platter. 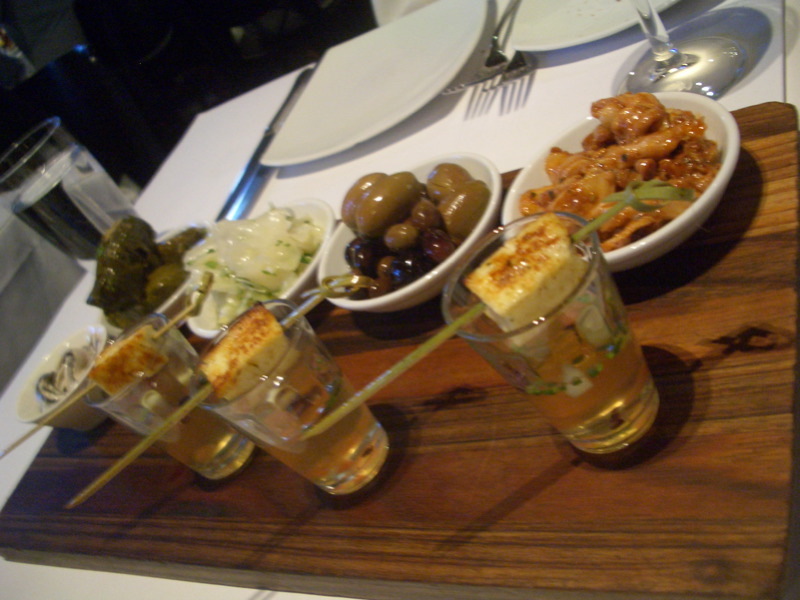 Starting on the far left and working clockwise we have: atherina (whitebait), dolmades, pickled cabbage, marinated olives, spiced baby octopus and three saganaki "martinis". Each of these tastes was delicious, but the stand-outs for me were the lemony oily atherina, the dolmades (which were slightly sweet - touch of honey methinks) and the gin-based saganaki martinis, a recipe for which can be found here. 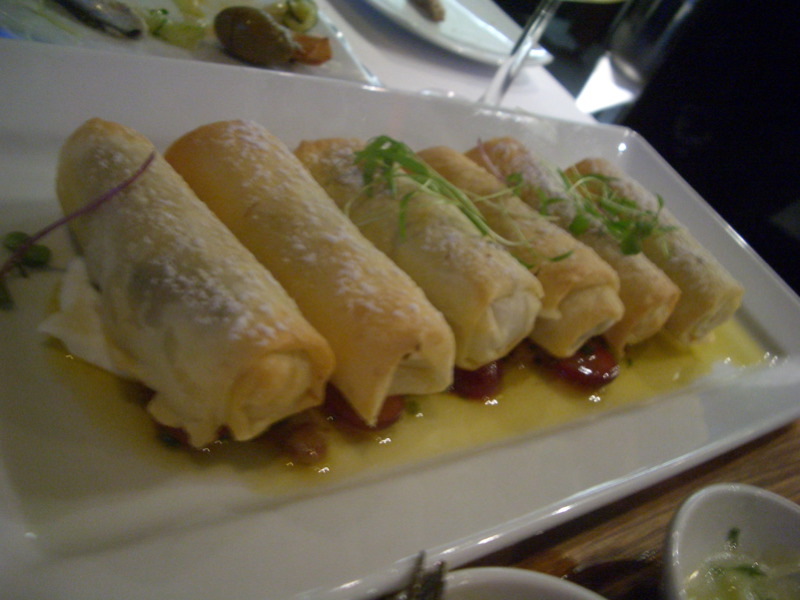 The other appetiser was lamb-filled lady finger filo pastries with labna and grapes. These were nice but didn't leave as strong an impression as the other dishes, though I did like the squishy labna oozing along the side of the crispy filo pastry. Course number three was Salates & Lathera (salads and vegetables). 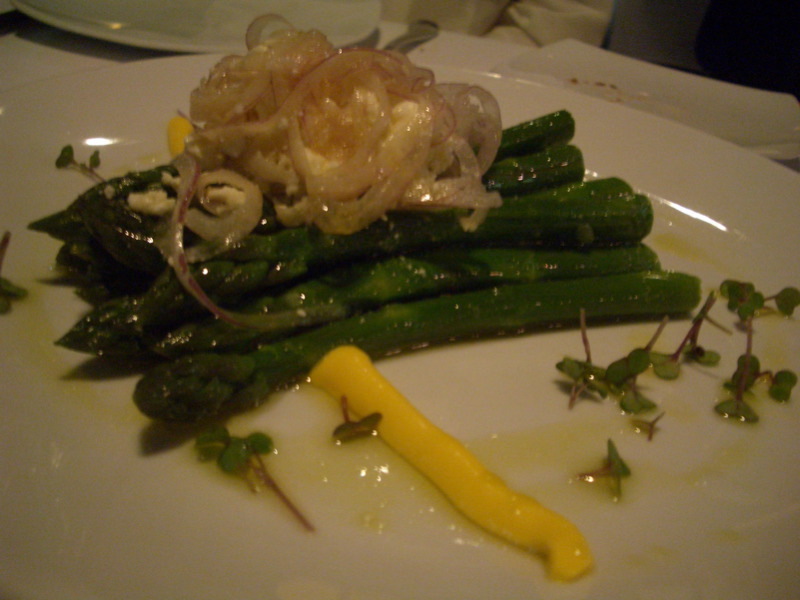 I loved this grilled asparagus with feta, onion and some sort of hollandaisey sauce. If anyone could correct me on what the sauce is, I'd appreciate it! This salad was exceptional. 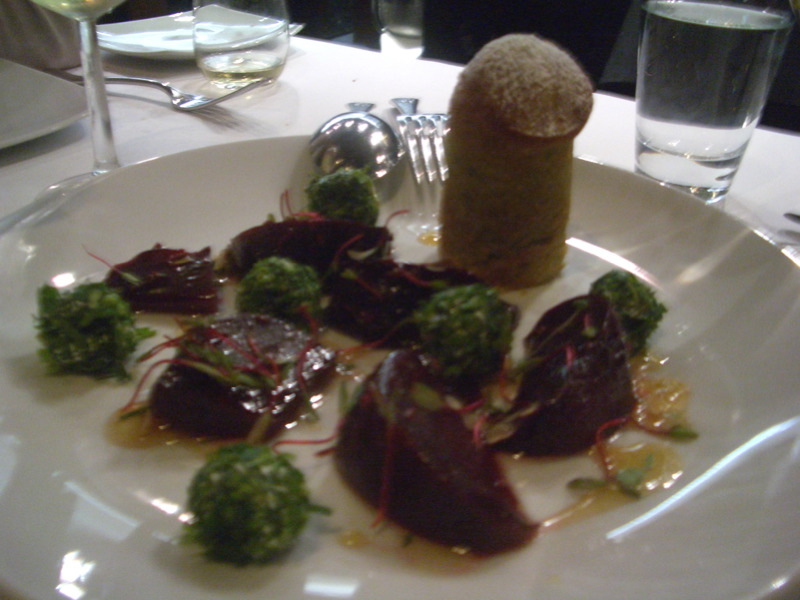 Cumin-roasted beetroot salad with pistachio "biscuit", yoghurt cheese balls and Attiki honey. The roasted beetroot was a wonderful rich flavour that contrasted beautifully with the sweet honey. The so-called biscuit was actually more like an Aussie teacake in terms of consistency. Its pronounced phallic shape made at least one of us snigger like a Year 8 boy in Jonah Takalua's gang. By course four, Kyrio (main course), the six of us were rapidly running out of room. It's a shame because both mains were also excellent. Hopefully you're not getting too bored of my saying each dish was excellent! The first main was seared tuna with carrot salad, babaghanoush and cous cous. The pieces of tuna were still ever so slightly rare in the centre, just the way I like 'em. 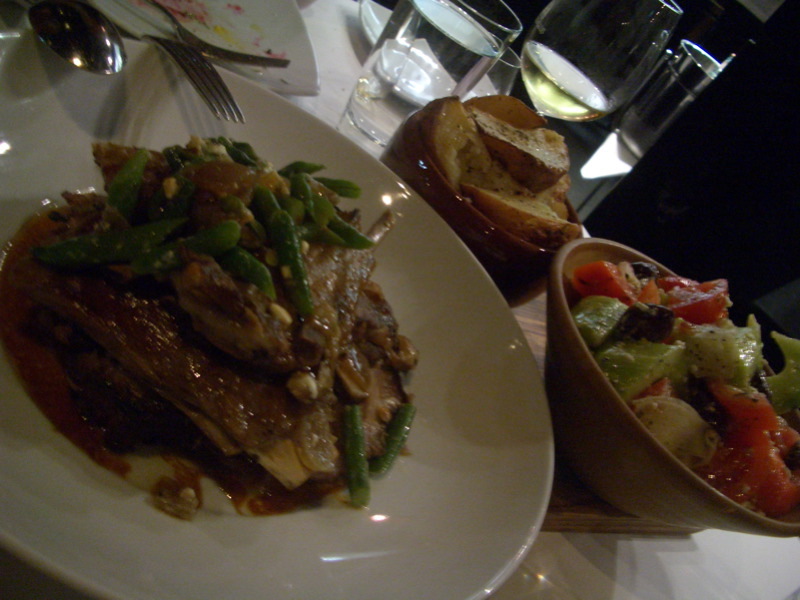 The other main was lamb from the spit roast with green beans, feta, Greek salad and slightly lemony potatoes.As you would expect, the meat was falling off the bone. I also really liked the dressing on the Greek salad. The final course was Glyka (sweets). 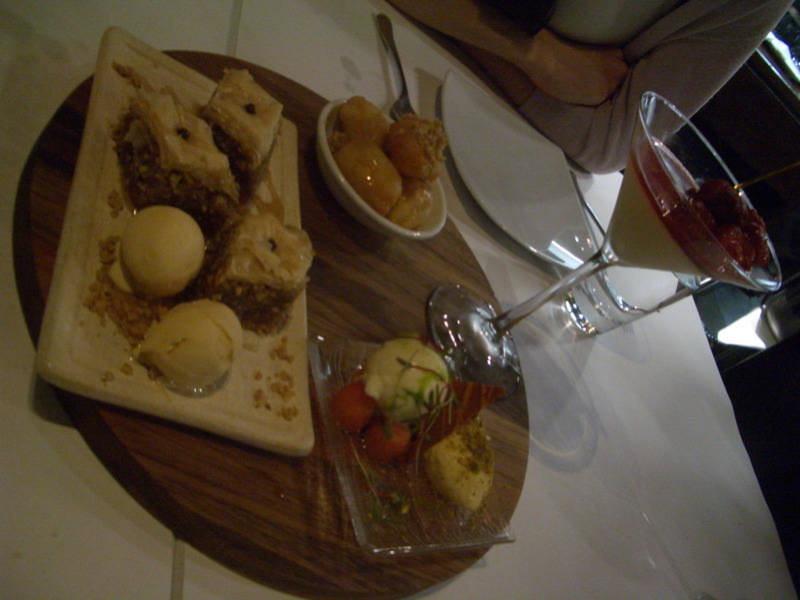 The lovely waitress who had been looking after us all evening brought us two huge dessert platters! On platter #1 we had (clockwise from top left): mastic panna cotta with strawberries, Ouzo crème caramel, chocolate marquise with pistachio ice cream and loukoumades with honey and walnuts. On platter #2 we had (clockwise from left): baklava with cinnamon coffee ice cream, more loukoumades, more panna cotta, and feta mousse with green apple gelato and watermelon. I will happily put my hand on my heart and swear that this is the best baklava I have ever tasted! 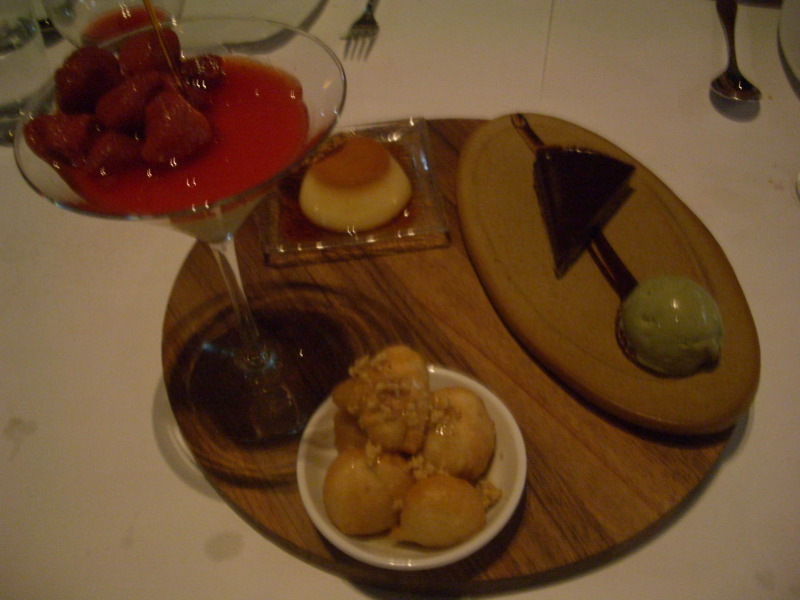 The marquise was very rich, and although I didn't really like the Ouzo crème caramel because I don't like the taste of aniseed, both it and the panna cotta had wonderfully smooth gelatinous consistencies. This feta mousse was the most unusual of the desserts. 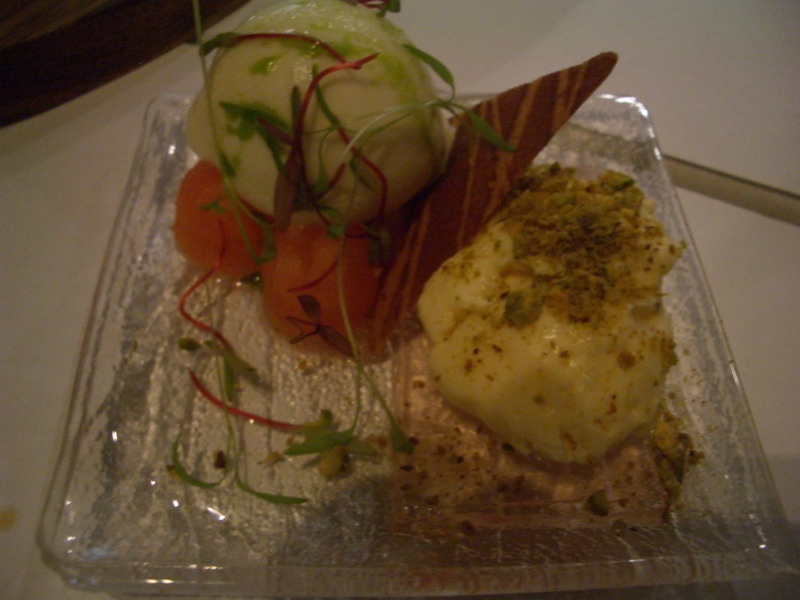 It reminded me of the goats cheese tiramisu I had a few months ago at D.O.C. in that it matched a fairly sharp cheese with dessert. K1 was wary, but I rather liked it. The green apple gelato it came with was superb - wish I could buy a tub of it to take home! Looks and sounds great Claire, and thanks for posting it. 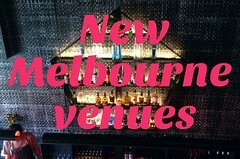 I have been meaning to try The Press Club for some time but can never get a booking (not organised enough to book weeks in advance). I will definitely have to just set a date aside and book it in. Have a safe and happy Christmas. Great review Claire. I'm want to go to the Press Club even more now. Like Jon, I'm not organised enough to book weeks in advanced. I tried booking a whole week in advance last time and the restaurant was still full. By the way, I love the Amelie reference. I love the burst of roe too and also cracking my creme brulee with a spoon. Jon and Thanh - you gotta get there! But I understand a lack of organisation preventing you from visiting a popular restaurant... that's the very reason I STILL haven't eaten at MoVida! They're always booked out plus there's a 45 minute wait at the bar, which I never have the patience to wait for. 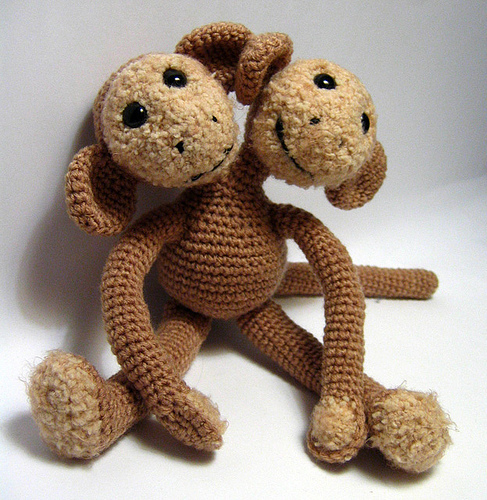 Happy new year to you both! I'm saving up... let me know if you ever go back there. Much as my friends like good food I can't see them willing to spend $75 on it..
but that looks just too good. 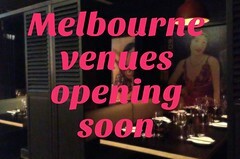 I finally got around to making a booking at The Press Club and will be eating there tommorow night. I think I will also be going with the Kerasama B menu. Stay tuned for my review.